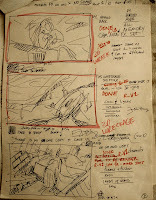 The obligatory blahblahblah about storyboards. 85-90% of From Inside animation utilizes original paintings from the graphic novel (11x14, alkyd oil glazes over charcoal and pencil. Made by hand during the dark, pre-digital era). The scanned images are either cut into pieces for animating or they are used as textures on 3D models. The graphic novel was treated, for the most part, as the storyboard. 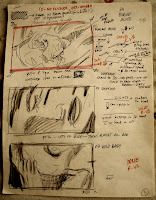 The storyboards made for the film are quick sketches of the comic panels with notes indicating what sort of pain and misery needs to be applied to the artwork in order to make a good animated shot: artwork extension, camera moves, 3D elements, effects, touch-up, etc. From Inside might be the most faithful comic book adaptation ever. The film is a panel-for-panel recreation of the book, using actual artwork from the book. Click HERE to see a couple of seconds from the finished shot (Quicktime). 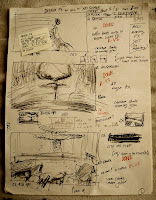 A few more storyboards (click to enlarge).